Portions of this post are from last year when I wrote about where I was on 9.11.01. I’ve added more thoughts so this is definitely worth a second look. Some people started coming in and rushed to see the TV’s, they’d heard the story on their car radio. I saw so many co-workers with tears in their eyes. These are people who deal with death everyday. Murders and other unexpected deadly accidents we deal with them every day and have to bring that news to people who watch our station. It’s sad you somewhat get immune to death. It’s not that every death doesn’t have an effect but you have to block it a little. This was different, this was an attack on America, this was something no one had ever experienced before. How could you deal with such a breach of our nation? How could you cope with the potential mass casualty? The world changed forever. The lives of an entire generation of people changed forever. Six years later, Osama bin Laden is still a threat and has just released two videos. They are the first that have surfaced from him in three years. Airport security is still high even though some critics still say the U.S. have much more to do to protect. 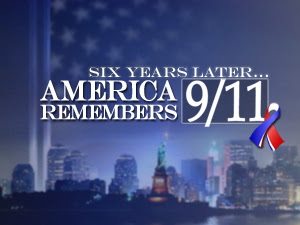 I’m reliving some of the horror of this day by watching MSNBC. The cable news network is replaying the coverage in real time. I do recall the hunger for information and how little it trickled out on that day. We all couldn’t do any work. We just sat at our desks watching coverage on televisions with our mouths literally gaping open watching in total disbelief.